The Cold steel Recon 1 is a great blade to take with you whether it's out hunting or camping with friends. The 4" blade folds neatly into the handle to allow a more compact and transportable knife. 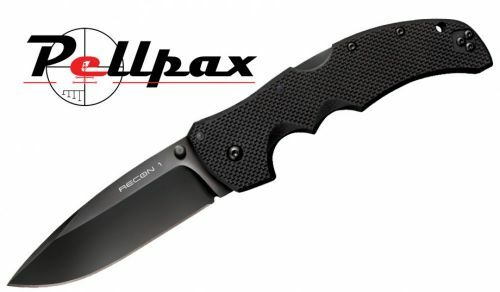 This Recon 1 knife has a spear point making is great for piercing thought tough materials or a razor sharp cutting edge giving it huge slicing potential. The blade itself is made from a super strong 8A Stainless steel making it very durable and ready to take on the strongest jobs. This is then complete with a black Tuff-Ex coating which helps prevent rust, and reduce friction allowing for a effortless cut. The 5", G-10 handle is super strong and sturdy. G-10 is a mixture of fiberglass and resin which is then compressed and heated for extra security. Although very strong this handle is comfortable to use and has a texture surface to ensure you get a good grip for the job. The finger groves keep your fingers away from the blade during use ensuring you get safety without compromising the comfort. The extra little features of this knife include the Tri-Ad lock which prevents the blade folding when large amounts of force are applied and the pocket/belt clip which allows easy transport without stopping access to your knife. Add this item to your basket & spend an extra £365.01 to apply for finance.